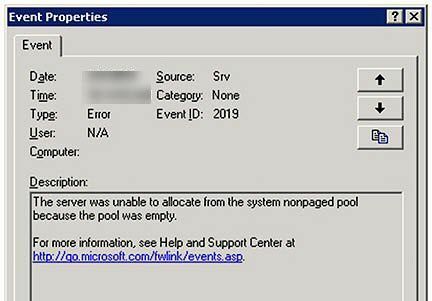 "The server was unable to allocate from the system nonpaged pool because the pool was empty"
They reboot the server, and the problem goes away for a while. KB 133384 for using Performance Monitor but couldn’t isolate the source of the memory leak. Performance Monitor Wizard and Perfmon.exe per KB 248345 for finding memory resource issues. The Performance Monitor Wizard simplifies the process of gathering performance monitor logs. It configures the correct counters to collect, sample intervals and log file sizes for troubleshooting. User Mode Process Dumper Version 8.1 per KB 241215 – The User Mode Process Dumper (userdump) dumps any running Win32 processes memory image (including system processes such as csrss.exe, winlogon.exe, services.exe, etc) on the fly, without attaching a debugger, or terminating target processes. Make sure to use the correct version for your CPU. Memsnap.exe – This command-line tool takes a snapshot of the memory resources being consumed by all running processes and writes this information to a log file. Debugging Tools for Windows was over my head, probably not useful except for programmer types. This article has a nice description of using Process Explorer to determine your system’s maximum values for Paged and NonPaged Pools, while this one talks about troubleshooting memory leaks. This one discusses capturing application crash dumps, which allows for debugging services such as Print Spooler. After using all these tools, I finally found the source of my problem with plain old Windows Task Manager. This article suggested viewing the Handle Count, with processes over 5,000 being suspect. Once I viewed the Handles column it was blatantly obvious JMBtnMgr.exe was the memory hog. I watched the handle count grow from 2,100 to over 6,000, when the server became unresponsive. After restarting the server I found a shortcut to JMBtnMgr.exe in the Administrator startup menu. I took the shortcut out of the startup menu, restarted the server one more time, and haven’t found it hung in four days.